I have been wanting to make my own sourdough for a while and it was on my New Years baking resolutions. (It was on last year as well but never got round to it.) 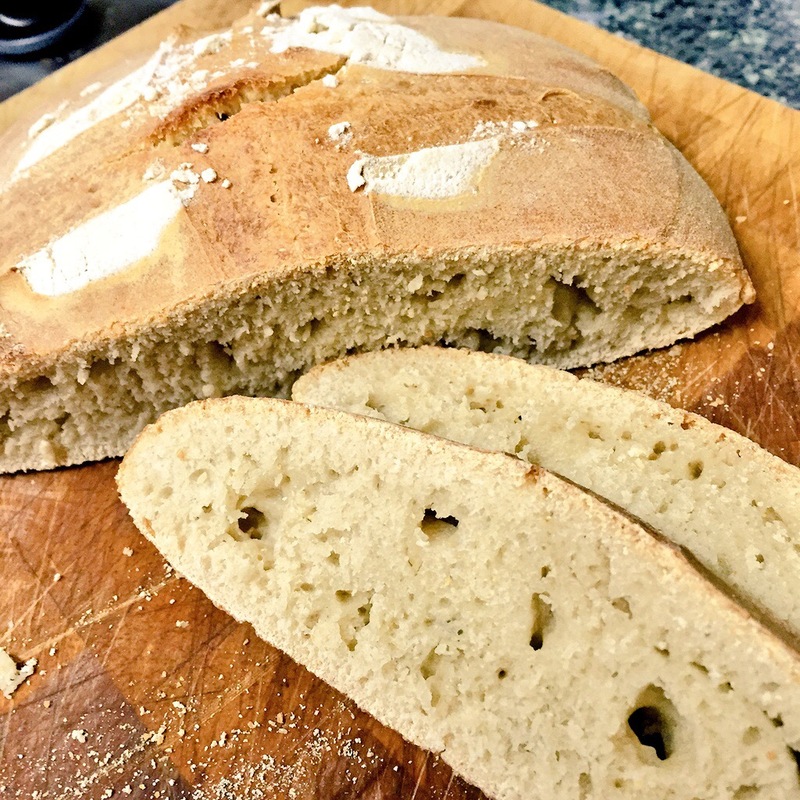 In the bread baking circle on social media, sourdough is seen as king due to the more intense flavours and once you start you never seem to go back to baking with shop bought yeast. I also know people who have sent sourdough starters all over the world. What really prompted this attempt though was The Gorgeous One having really bad Acid Reflux after an extremely bready day followed by pasties in the evening. My thought was that sourdough might affect him less. Now there are many different recipes for starters from simply flour and water, using apples or grapes, to concoctions from yoghurt. With the support of my fabulous twitter friends (@dbtsauce, @thecraftylarder, @bakerbearded, @breadstead, @keepcalmfannyon, & @wingcottage) I have gone for the simple flour and water method loosely based on thekitchn.com. Whisk 100g strong white bread flour with 125ml of water to make a thick paste and transfer to your container. I am using a kilner jar as The Gorgeous One bought me a massive one for this very purpose. However, my twitter chums had some very good advice and told me to remove the rubber seal as there have been cases of jars exploding due to the pressure increase from the gas released. This is something I understand from my dad’s attempt at home brewing which one warm July night exploded all over the kitchen in a bit of a chain reaction of one exploding bottle triggering another. Keep the container open to the air for an hour and then seal and leave overnight. After reading about how grapes help the process I left mine open next to a bunch of reduced sable grapes from the supermarket in the hope that some of the natural yeast would transfer to the starter. I think putting the starter next to the grapes was a good idea as after a day it was already very bubbly! 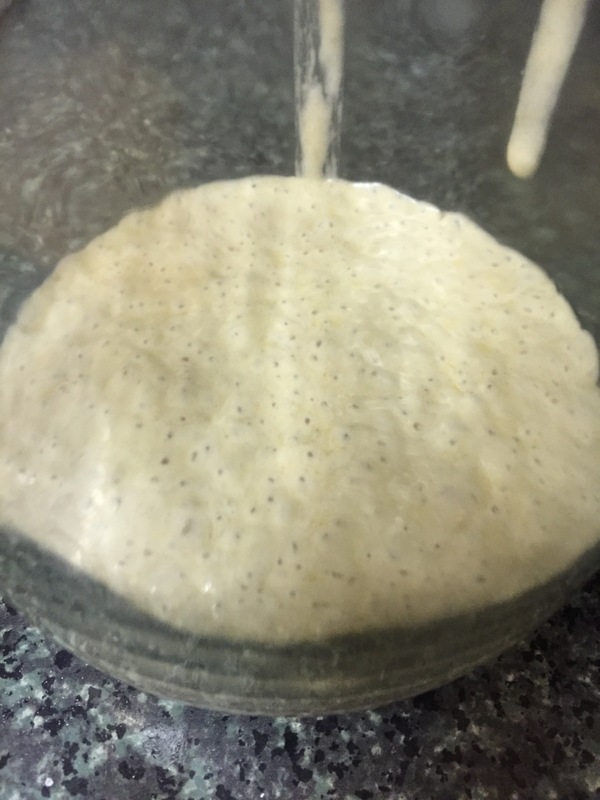 I fed the starter with another 100g of strong white flour and 100ml of water and whisked to combine. 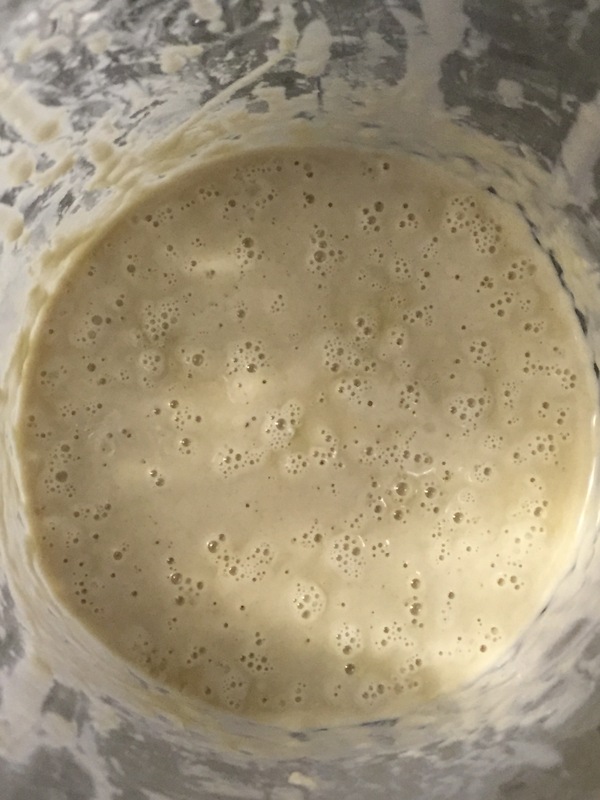 Now my starter needed a name, as this appears to be a tradition with sourdough bakers (well with the Australian ones at least, @figlimeandjam has Priscilla and @dbtsauce has Conchita). I decided to call her Una as she is my first sourdough. Bubble city! 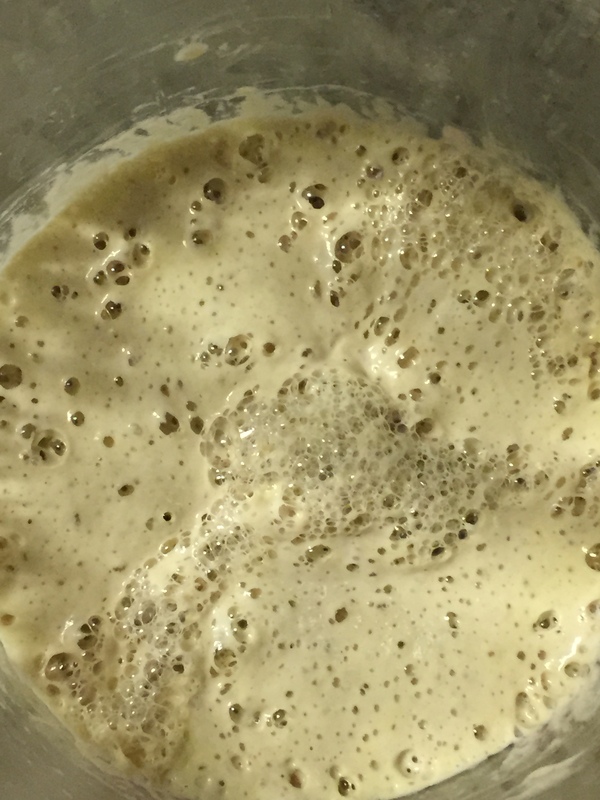 My starter is completely filled with bubbles and even generating a little foam. From my reading Una appears to already be at the 5 day stage. Now I faced a dilemma as there were 2 methods for feeding the starter. Method 1 involved feeding the same amount each day and method 2 required you to discard half the starter each day before feeding. I didn’t want to throw away part of Una each day as it looked to be a waste so I opted for method 1 and fed Una 100g strong white flour and 100 ml of water. Una was significantly less vigorous today and there was a millimetre band of yellow liquid on the top. 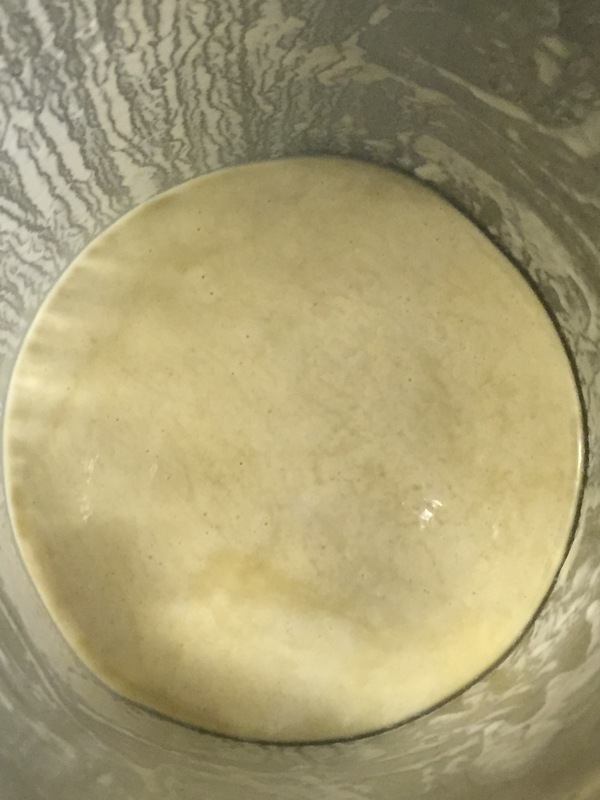 Cue mild panic and frantic blog reading and I added 100g of flour with only 50 ml of water and whisked it into the starter in the hope that this would absorb the rest of the liquid and because I had read this would slow the starter down. There was a centimetre thick band of yellow liquid floating on top of the starter, this was clearly wrong and I was thinking “this is why you cannot have a pet!” I hadn’t even made anything with Una and was one step away from killing her. A definite change of approach was needed so I decided to switch methodologies. I poured off the yellow liquid at the top and also got rid of half the starter. I fed again this time with 100 ml of water and 100g of strong white flour. Fingers crossed. Wahoo I had managed to recover Una! She was back to bubbling away and it seemed the answer really is to discard half the starter each time you feed even though it feels like a waste. Either weigh the starter and feed the same weight (in effect doubling each time) or chuck half and feed a consistent amount. Use a container you can fit in the fridge, the kilner jar was lovely but too big so instead of maintaining the starter in the fridge and feeding once a week I had to feed every day. If it starts going wrong the starter can be saved. To look awesome whilst baking buy a tshirt from Breadstead! 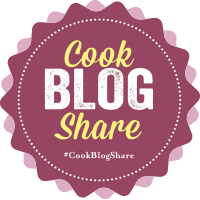 This entry was posted in Bread, Recipes and tagged baking, bread, bubbles, near disaster, Sourdough, sourdough starters, starter, white bread flour. Bookmark the permalink. Unfortunately Una has since ceased to be. Used her all up at the weekend before going on holiday. Oh no! At least you can start some more… I haven’t used mine for a while actually – I need to revive her from the fridge! The liquid is fine – its alcohol I think, just stir it back in! I got my error handling tips from thekitchn.com but fingers crossed next time.